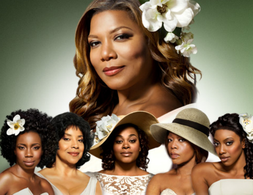 On Sunday a remake of the film Steel Magnolias premieres on the Lifetime network, starring an all-black cast featuring Queen Latifah, Alfre Woodard, Phylicia Rashad, Jill Scott, Adepero Oduye and Condola Rashad. The original 1989 movie was about the lives of a group of Southern women portrayed by Shirley MacLaine, Sally Field, Olympia Dukakis, Dolly Parton, Daryl Hannah and Julia Roberts (whose performance was nominated for an Oscar). Set in a small Louisiana town, the interwoven stories of love and loss inevitably test and strengthen their bonds. The Steel Magnolias redux made us wonder here at The Root about other film remakes that have bet on black. Released in 1989, Steel Magnolias was drawn from the 1987 eponymous play by writer Robert Harling, who based the story on his own sister. Focusing on M'Lynn and her daughter Shelby, the movie depicts their lives through marriage and childbirth and Shelby's struggle with an advanced stage of diabetes, cushioned by a group of supportive friends. In the new version, Queen Latifah and Condola Rashad reprise the starring roles. Chris Rock starred and directed in 2007's I Think I Love My Wife, which he co-wrote with comedian Louis C.K. In the original film, released in 1972 and titled Chloe in the Afternoon, Richard Cooper is bored with his reliable married life with kids when he's visited by Nikki, an alluring woman from his past. In 1967 Sidney Poitier shook up America with his turn as John Prentice, a black doctor meeting his white fiancée's parents for the first time in Guess Who's Coming to Dinner. In 2005 Bernie Mac gave the serious subject matter a more humorous take as he played the father of a young woman engaged to a white man, played by Ashton Kutcher, in Guess Who. If there's a list of fantastic musicals, then 1978's The Wiz must be included. Who can ever forget Evilene (Esther Rolle) and her request for "no bad news"? In this remake of the 1939 film The Wizard of Oz, Diana Ross and Michael Jackson eased on down that yellow brick road as Dorothy and the Scarecrow. Drawn from the Rodgers and Hammerstein musical, the 1997 made-for-TV movie Cinderella was a nod to the 1950 Disney animated feature film. Brandy and Whitney Houston acted alongside each other on the small screen and gave little brown girls a chance to see themselves in the classic fairy tale. In 1958, playwright Tennessee Williams' fifth Broadway play became a film with Cat on a Hot Tin Roof. Starring Elizabeth Taylor and Paul Newman, the story surrounds two sons and their wives celebrating their aging father's birthday. In 2008the play returned to Broadway with an all-black cast including Anika Noni Rose, Terrence Howard and James Earl Jones. Mike Epps and Cedric the Entertainer reprised the roles of Ed Norton and Ralph Kramden in 2005's The Honeymooners. The original sitcom, led by Jackie Gleason and Art Carney, debuted in 1955 and lasted only 39 episodes because of ratings, though the show enjoyed seasonal specials. Eddie Murphy led the 1998 remake of 1967's Dr. Dolittle as John Dolittle, a veterinarian who communicates with animals. In Murphy's go-round, the film's cast included young black actors Kyla Pratt and Raven-Symoné. Although The Nutty Professor was cheesy, Eddie Murphy's 1996 version did give R&B one of the genre's hits in Case's "Touch Me, Tease Me," featuring Foxy Brown and Mary J. Blige. In the film, Jada Pinkett starred as Murphy's love interest, while Murphy himself played at least three other characters in the movie that took another stab at Jerry Lewis' 1963 version. This 1986 romantic comedy starred Demi Moore and Rob Lowe as love interests who must explain their nascent relationship to friends. According to Shadow and Act, Michael Ealy and Regina Hall may join Kevin Hart in an upcoming About Last Night remake, to be released by Screen Gems and produced by Think Like a Man producer Will Packer. This classic 1937 film has seen numerous remakes, with stars like Barbra Streisand and Judy Garland filling the shoes originally worn by Janet Gaynor, but only one redux will have a black leading lady. Beyoncé signed up to star with Bradley Cooper in an upcoming version of A Star Is Born, as a young actress who moves to Hollywood and finds help in an alcoholic actor who is past his prime. The film has yet to begin filming. A twist on 1947's The Bishop's Wife, starring Cary Grant and Loretta Young, the 1996 family-friendly remake, The Preacher's Wife, starred Whitney Houston and Denzel Washington. Thanks to a handsome angel who appears and shells out advice, the movie's ministerial couple find new faith in God and each other. In 1962 The Manchurian Candidate, starring Frank Sinatra and Laurence Harvey, hit theaters, and in 2004 Denzel Washington and Liev Schreiber led the redux. In the film, soldiers are brainwashed for violent purposes and a man tries to stop it. If only Bram Stoker had known that his 1897 novel, Dracula, would get a funky Blaxploitation twist with 1972's Blacula. The film, which starred William Marshall and Vonetta McGee, touted Blacula as "deadlier than Dracula" and followed an African prince bitten decades before who ends up in Los Angeles and needs to feed.